The main building of the temple is four floors high. 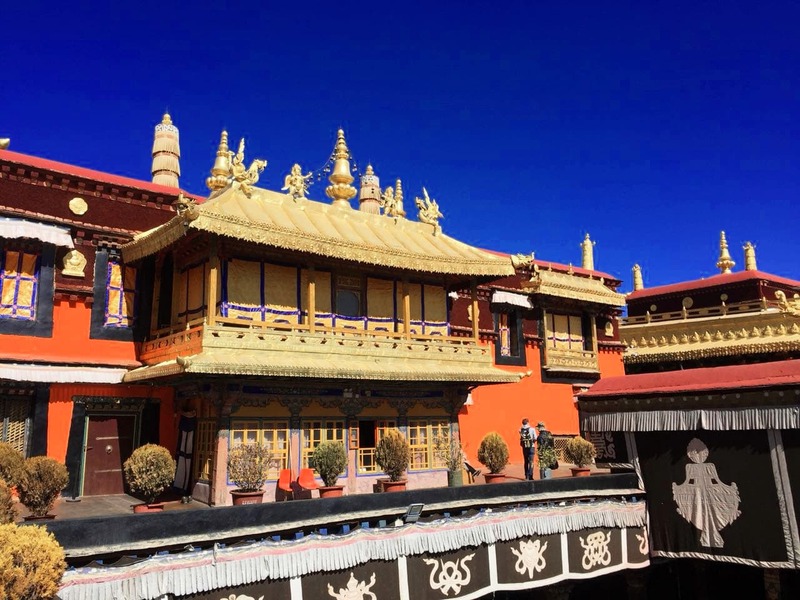 All buildings in the center of Lhasa cannot be higher than four floors.That allows everyone to see the golden roof of Jokhang from roofs of all other buildings in Old Town. Jokhang is recognized as the World Cultural Heritage by the UNESCO. 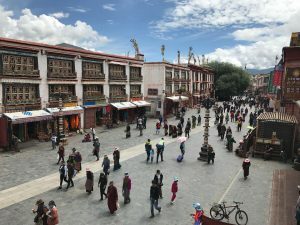 Jokhang was founded around 647 AD. The king Songtsen Gampo married Chinese princess Wencheng and Nepalese princess Bhrikuti to make an alliance with neighboring countries. Both of them arrived in Tibet with holy statues and sacred objects. 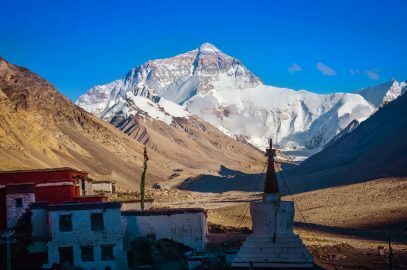 The king initiated construction of the Jokhang to house a statue of Jowo Mekyo Dorje, a representation of eight years old Shakyamuni, brought to Tibet as part of the dowry of his Nepali wife. 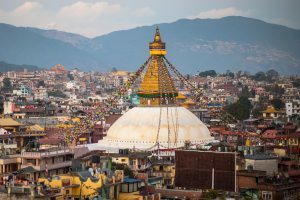 Consequently, the temple is facing West, where Nepal is located. 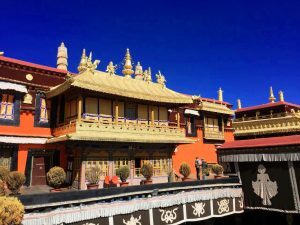 At the same time, the Ramoche Temple was constructed to house another important Buddha statue, Jowo Sakyamuni, representing Shakyamuni at the age of twelve, brought to Tibet by the king’s Chinese wife. That’s why the Ramoche Temple faces East, where China is located. 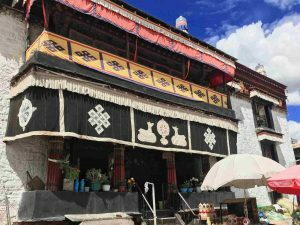 The Jokhang temple was constructed on the Otang lake. According to the legend, thousands of goats carried soil to fill up the lake. To this day some can hear the sounds of the water. Newari artisans came from Nepal to work on the construction. 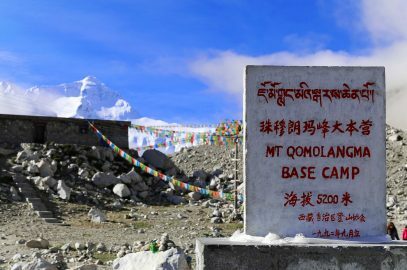 After the death of King Songtsen Gampo, Tibetans moved Jowo Sakyamuni statue from Ramoche to Jokhang to protect it from Tang army that intended to take it back to China. 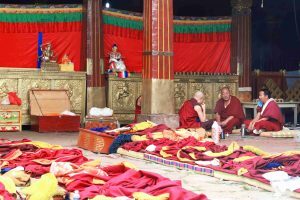 The statue remained hidden in one of the halls of the Jokhang until king Tride Tsugtsen’s wife brought it out. Nowadays we can see the original building with many elements that are dating back to the 7th century. There were, however, many additions to the complex. The courtyard appeared during the Tsongkhapa’s time. Later the Fifth Dalai Lama enlarged it and reconstructed some elements of the temple. A few interior carved pillars and entrance arches remain original from the 7th century. It is the work of Newari artisans, who came from the Kathmandu Valley in Nepal to work on the construction. 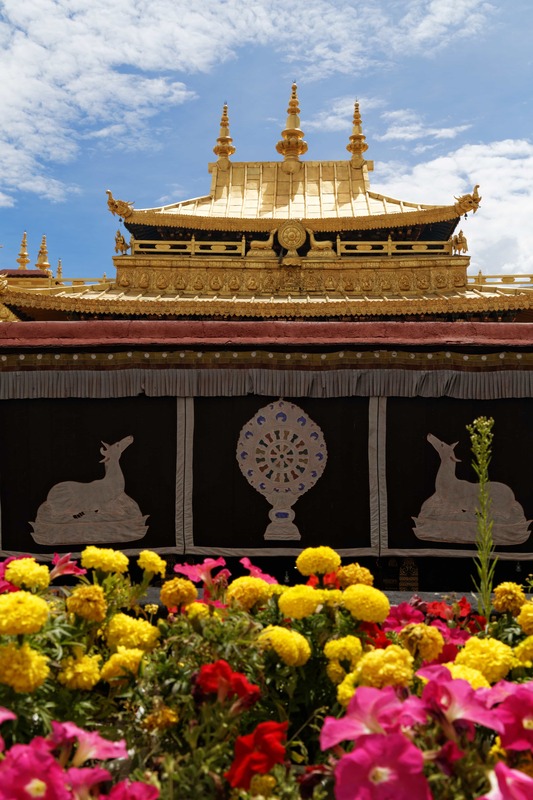 During the Cultural Revolution, the interior of the Jokhang was severely damaged and many artifacts were stolen. The temple was later restored. Jowo means supremacy. Tsongkhapa (lived in 14th century, the founder of the Gelug sect of Tibetan Buddhism) offered to the statue the golden crown with symbols of five Dhyani Buddhas. Visvakarman erected the statues of eight and twelve years old Shakyamuni and later Shakyamuni consecrated them. Jowo Shakyamuni statue had been in Bodhi Gaya in India before Indian king sent it to Chinese king as a gift. Later, Princess Wencheng brought the statue to Tibet. 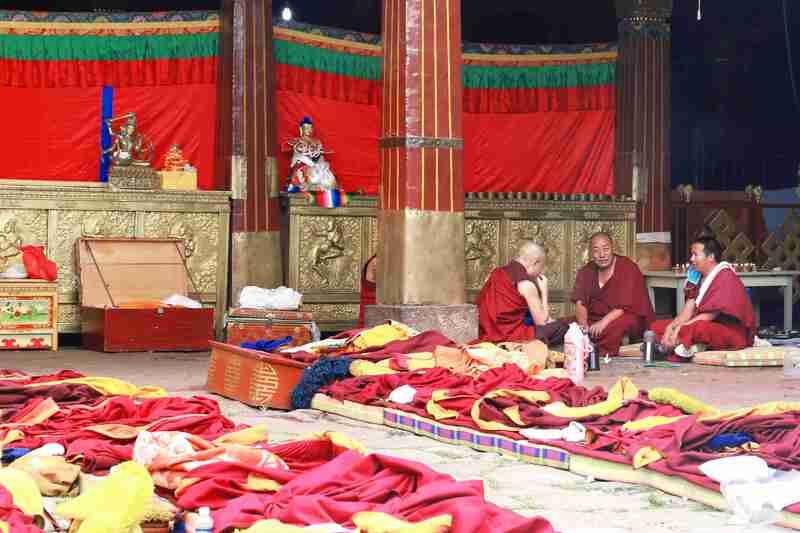 Early in the morning, Tibetans visit the Temple. If you walk near the entrance of the Jokhang, you will see Tibetans lining up in front of it. We recommend visiting it in the afternoon when it is generally less crowded. We begin by entering through the main gate and passing by pilgrims prostrating in front of the Temple. Four Guardian kings statues guard the entrance to the temple. When we get to the courtyard, you can see wall murals depicting the history of Buddhism. Depending on day and time, you can see monks chanting there. You can take photos of an unobstructed view of the Jokhang. Once we get inside, you will see the statues of Padma Sambhava (Guru Rinpoche) and the Future Buddha (Maitreya) in the center of the main hall. There are small chapels on all sides of the temple. 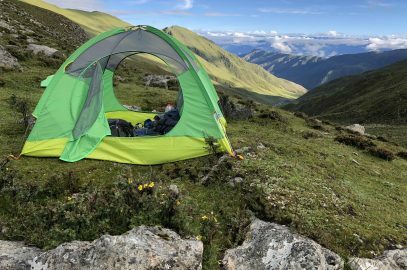 We will walk in the clockwise direction and you can visit some of the most important chapels, including the chapels of Tsongkhapa, eight Medicine Buddhas, and Avalokiteshvara. You will see the main statue of Jowo Shakyamuni in the rare of the Jokhang. Unlike most of the statues of Buddha that portray him as a simple monk (after his enlightenment), the statue in Jokhang depicts the 12-year old Buddha. At that age, he was still a prince and the statue is heavily decorated with gold and precious stones. The chapel is open for Tibetans only, but you can still see the statue. We proceed to the stairs to the first floor, where we will find several other chapels. After visiting chapels, we will go up to the roof. 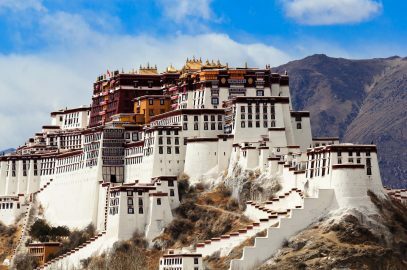 From the roof of the Jokhang, you can get a splendid view on Lhasa and the Potala Palace. Walk around the temple with pilgrims, monks and local Tibetans. 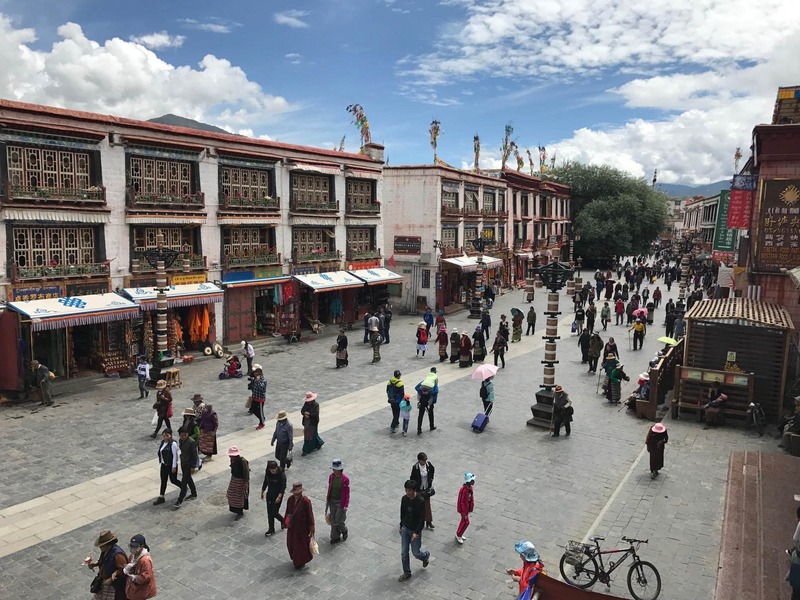 Barkhor street surrounds the Jokhang Temple. 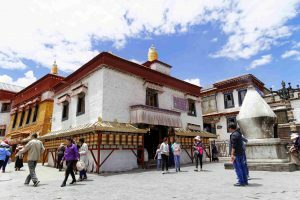 In the beginning, it was a simple path that pilgrims walked around the newly built Jokhang Temple. 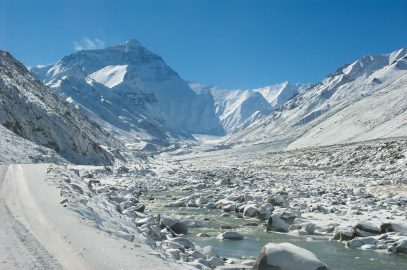 Later, it grew to be the central area of Lhasa. Many houses of noble families were on Barkhor street. Some buildings that you can see are dating back several centuries. Nowadays, the street is also famous for its shops selling books, paintings, statues, rugs, souvenirs and much more. There are a few restaurants for those who want to take a break from the busy city center. Visit small monasteries or temples on the Bakhor street. 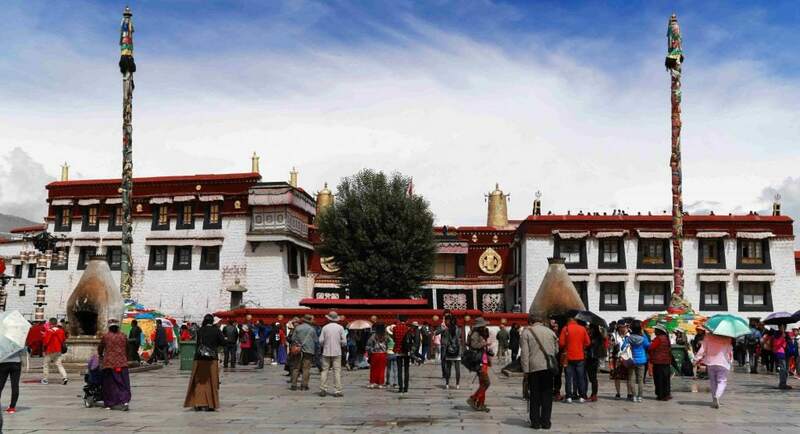 They are usually less crowded than Jokhang, and many of them are old and interesting. 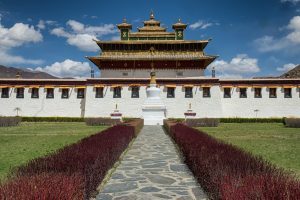 The Mani Lhakhang (main building on the first photo) houses a prayer wheel that pilgrims set in motion, sending thousands of prayers. The yellow building to the left from it is the Future Buddha Chapel. There are many statues of protectors. There is also a meditation cave. If you continue walking down the street (going right from Bakhor if walking clockwise), you will first see the Gongkar Chode Chapel on the right. It is easy to recognize it by the wall paintings on the black background by its entrance. At the end of the street, you will find an entrance to the Meru Nyingba Monastery (on the second photo). 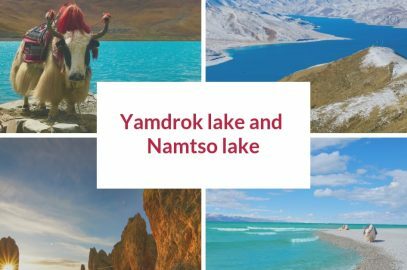 It was originally built in the 7th century and is very popular among Tibetans.